Salling Group (former Dansk Supermarked) | itelligence, a.s.
We have experienced skilled and attentive consultants, who went the extra mile in order to understand our needs. 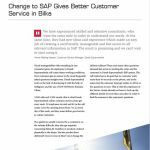 At the same time, they had new ideas and experience which made an easy job of creating a user-friendly, manageable and fast access to all relevant information in SAP. The result is promising and we can’t wait to start using it. Dansk Supermarked Group is Demark’s largest retail business with more than 1,500 shops. Visual manageability with everything in one screenshot gives 40 employees in Dansk Supermarkeds call centre better working conditions. Now customers get an answer to the most frequently asked questions straight away. Dansk Supermarked took on the task of developing it with the help of itelligence and the use of SAP NetWeaver Business Client.